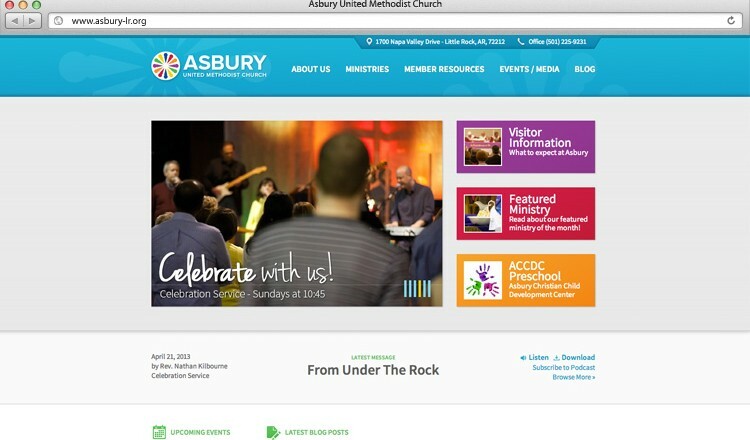 For the complete overhaul of Asbury United Methodist Church’s website Zach and Casey from Lamplight Media called me in to join them to help build a new design. Inspired by the colors of their prominent stained-glass window and wanting to bring this website fully into the 21st century we created a clean and modern site that pops with bright colors. It was great teaming up with other professionals to build such a worthwhile and user-friendly new site. Brad is a delight to work with. Working with Brad was one of the best decisions our organization made. He is a consummate professional and delivers a beautfiul product in a timely fashion. He strives to make the website easy to navigate, practical, and visually appealing. Brad was always extremely prompt and professional in turning around what we requested. And Apt Design brought top quality design elements and ideas to the table for our consideration. Brad executes a project with such ease that it really makes for an enjoyable experience. I trust Brad and would highly recommend his design solutions to anyone. He is very easy to work with and very reliable. He is always willing to come up with some great ideas and to educate us to do some some things on our own to save us money which is greatly appreciated! I have seen Brad’s web design work on two separate and very different projects. I was impressed on each occasion with the time he took to really understand what the customer wants and needs from each project, leading to a great website both times. We’re proud of what the public experiences when they come to our Run Wenatchee website. The site is clean, well-organized and lively, and for good reason. Brad Fitzgerald took the early design concepts we had in mind and made those come to life in a singular fashion. When it came time to design my website choosing Apt design was the best decision I could have made. Apt Design is always on time with all projects and the quality of work is second to none. I would recommend him to any business that seeks to improve their image and market share. Brad is more than a service provider, he is a business partner. The thing that I have always appreciated about Brad is his timeliness in turning around great new designs even in the face of looming deadlines. Creativity is at the heart of good design and Brad is blessed with an abundance of creative DNA. Brad’s professional, straightforward and timely approach to design creation and implementation will make your life easier. Since completion we have noticed increased customer usage of our website for research and enjoy additional business from these new customers. Brad comes to you from Boswells highly recommended. …artistic intuition that can’t be learned, keen insight into what a project needs, the people skills to lead the creative process, the organizational skills to manage the whole undertaking, and the work ethic to get the job done when and how it should be. The design work is flawless, the content is accurate and always within the project budget. He is consistently able to be reached, is open to questions and comment, and each project has been completed on time. I love working with Brad! His eye for detail is what really differentiates him from other designers. When I work on a project with Brad, I always know that the finished product is going to be stellar. I can count on Brad. When he says he’s going to do something he gets it done. That accountability is probably one of the most important things I can have from someone I work with. Brad is certainly one of the most accountable people I’ve had on my team. When you hire Brad you get his creative talent mixed with dependability and you end up with someone who is really great to work with. Brad did an incredible job of building our web site. We would recommend Brad to anyone needing a creative and highly functional site for their business. What I love about Brad is that he can capture the vision of what I am wanting designed and make it even better than I imagined. To top it all off, Brad is just a really nice guy and he’s easy to work with!